Throughout history bilingual people have been (and still are) asked some fairly silly questions. What if the shoe was on the other foot – what questions could we as bilinguals ask? 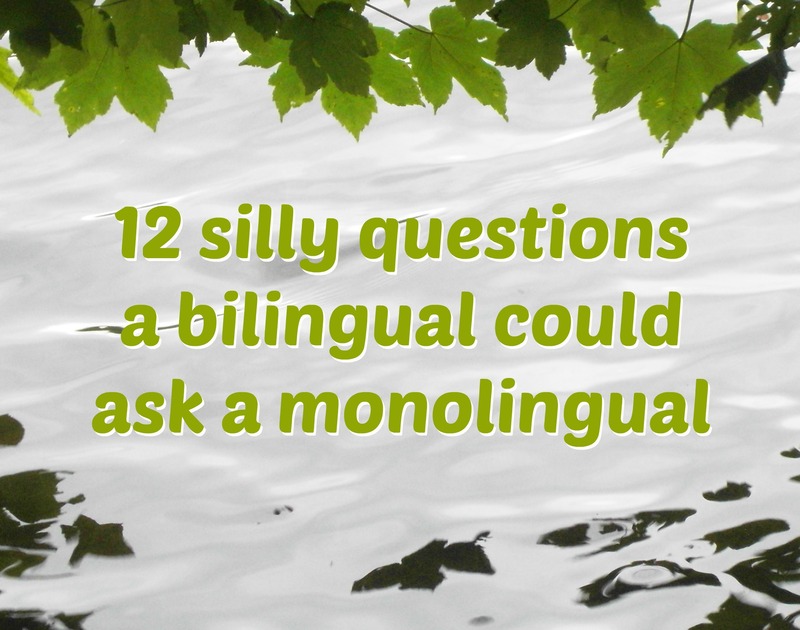 1 – What have you done to cure your monolingualism? Bilingual people have been classed as strange and some people have wanted to shield children from the perils of speaking more than one language. What if monolingualism were instead to be classified as a deficiency that should be remedied? 2 – How does it feel to know only one word for something? Bilinguals have been described as having a split identity because they have several words for the same things and phenomena. What if monolinguals were to be labelled as having “restricted” personalities? 3 – Why are you depriving your child of the advantaged of bilingualism? Many parents of bilingual children have had to answer questions about why they are confusing their child or why they are making their child’s life so much more difficult with the many languages in the family. In today’s world there are several ways parents can help their children to learn another language – why wouldn’t they do it? 4 – How does it feel being a part of the monolingual minority of the world? Depending on how strictly you define the term ‘language’ the estimates of how many people are bilingual vary between 55% and 65% – in any case, monolinguals are in the minority. However, in many places bilinguals are still not being considered when governments set their policies. 5 – When will you start speaking more than one language in the family? Many bilingual families have been incorrectly advised to change their use of languages and stick to only one language – what if families were to be told to introduce another language instead? 6 – Why did you choose a monolingual school for your children? What if immersion and bilingual schools were to become the norm and you would have pay extra to send your child to a monolingual school? 7 – Do you know how much less you will earn in your lifetime as you can only speak one language? The estimates of the increase in earnings for bilinguals vary between 2% and 10% – in any case, a significant amount in anyone’s books. In addition, I think bilinguals should also get a tax break of at least 5% per additional spoken language. Are you with me? 8 – Most people are bilingual – how come you speak only one language? Monolingualism has been the norm for so long, what if we were to start presuming that everyone should be bilingual? 9 – What do you do to exercise the executive control area of your brain? By switching between two languages, bilinguals automatically do brain training which strengthens the executive control centre of the brain. This and other bilingualism benefits help bilinguals function longer if dementia hits us – so we are less of a burden to the health care system. We really should be awarded tax benefits! 10 – Children can learn two or more languages at a very young age – you are an adult, how come you haven’t? Instead of just being amazed at the language skills of bilingual children – why not turn the spotlight on monolingual adults? 11 – Doesn’t it get boring to always speak the same language? That’s a thought now isn’t it? If you do speak more than one language, can you imagine speaking only one? Variety is the spice of life – why only speak one language when you can learn two, three or more? 12 – Was it a hard decision to stay monolingual? What if all communities and schools were geared to ensure that everyone becomes bilingual and that staying monolingual would have to be a conscious decision which you would have to defend from time to time? These questions are tongue-in-cheek and (mostly) unfair, and I am certainly not saying we should actually ask them. But because they sound so out-there, what do they tell us about the situation today? How far are we from bilingualism being accepted all over the world and being taken into consideration when education and cultural policy decisions are made? What do you think? Great post, loved the way you turned things on their head by looking at questions bilinguals could ask monolinguals! Shouldn’t the last question be “Was it a hard decision to stay a MONOlingual”? Of course it should! Thank you for pointing that out 🙂 Will correct. In fairness, I’ve never heard any of these voiced when someone is bilingual. In fact its usually looked on with envy. Hi Peter – well, these questions would not be placed to bilinguals. The ones we get are for example: “Which language is your favourite?”, “Which language do you dream in?” and “Which language do you think in?” I do know several parents of bilingual children who have been questioned why they are confusing their children by the use of many languages and also been asked to drop family language so that their child’s language development doesn’t get delayed. Thank you for the post. Many people forget that Deaf people and CODAs (children of Deaf parents) are bilingual or even multilingual. My 3.5 year old bilingual daughter has been exposed to native ASL (American Sign Language) since birth. Today she speaks ASL as fluently as any English-speaking three year olds and her language developmental milestones in ASL is on the same line as spoken language (neuroscience studies show that linguistic regions in the brain activate the same in signed language and spoken language). She speaks English well as any 3 years olds whose English is a second language. I know by age 5, she will speak English as fluently as any English monolinguals. You are right, Jolanta, and I am the first one to admit that I do not write much about children with sign language as one of their languages – this is because I do not have much experience in sign language. This doesn’t make the topic any less important, though, and I would like to invite you to write a guest post on it. How fantastic that your little girl knows ASL, I envy her! Great piece Rita! I would add to the list of silly questions “Why limit your world view?” Each language projects a unique world view, unavailable to those who prefer the Mono Setting on their language stereos. Yes, absolutely! I love your comparison to the sound setting on a stereo – perfect! May I just say that you do not ‘Speak’ ASL, you use it. Thank you for the correction, Charles! Sometimes life is too difficult and some people can’t afford to learn another language. I think being bilingual is very important, but sometines there are another important things that can’t be ignore. My granfather, my father, my mother…. all of them are people who haven’t got the choice to be bilingual. It is not useful to see monolinguals people as lazy people. Maybe a bit of comprehension would be better. I am sorry if I have done any mistake. I have been focus on sciences instead of on languages. Do you know how the universe works? I am doing my best on it, without leaving the languages. – in case you didn’t notice, this post was written as a bit of fun and as a contrast to the many questions we bilinguals have to answer throughout our lives. I have many monolingual relatives and friends and I certainly do not think any less of them! I love science and am fascinated by how the universe works. I look with envy how my husband breezes through books on quantum mechanics. But I leave writing about it to those who know much more about the topic than I will ever do. I will continue to write about what I do know about, bringing up a bilingual children, and sometimes I will write in a way that may stir up a bit of controversy. Glad you found my blog! I love this Rita. It certainly makes you think. I wish I could speak more than 2 languages, 4 or 5 would be great! !